Been away for a long while, but just thought I'd share some thoughts on the mcclelland bulk oriental I'm enjoying in an Eric Paulson nosewarmer on the back deck. It's not as sweet as I remember. A little more lat forward and somewhat simple. I always thought this bulk offering smelled like Frog Morton Cellar but I find its not nearly as sweet and doesn't quite measure up. That being said it's still a nice evening smoke on this warm summer evening. Secondly, I don't think I'll break out the Eric Paulson stub for this one again. I broke this pipe in with a healthy dose of red cake and McC Boston 1776 but still searching for that go to tobacco for my newest pipe. I don't have too many nosewarmers, maybe there's a science to them that I've not caught onto yet. The pipe smokes wonderfully, just haven't had the perfect smoke in her yet. Which McClelland bulk was it? I've been smoking 1776 and PCCA Highlander lately, both are strong virginias with a touch of oriental, and have been wondering about a couple of the bulk offerings such as 2025 and 2050. In my experience, more often than not the pipe tells you what tobacco it wants, and some are just naturally suited to certain tobaccos. I think it has more to do with the individual piece of wood and the engineering (including size and depth of chamber) than the shape or length of the pipe. You could likely smoke a different nosewarmer that would perform differently with that tobacco. But, if you have a pipe that loves Red Cake, let it eat cake! I think 2020 is great. I didn't like 2045 as much. It was too light and seemed aromatic-ish. Yeah, it was the 2045. Very light, lacking somewhat. I've got my sights set on a nose-warmer myself. 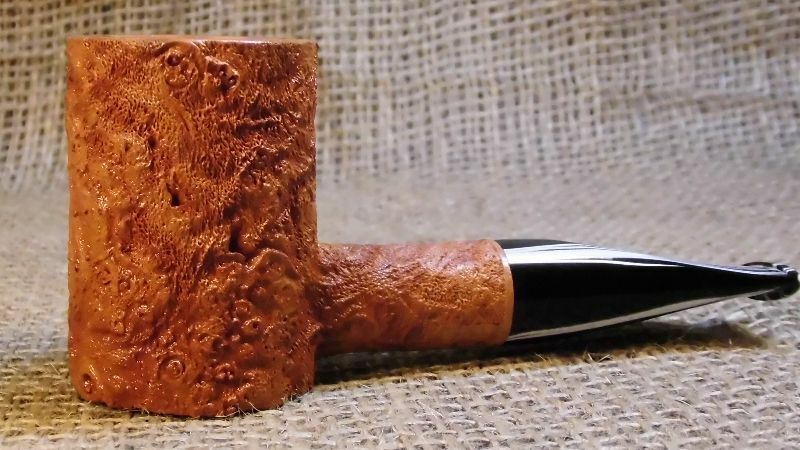 I hope to snag a nice, short Icarus apple at the Nashville pipe show next month. Never owned a nose-warmer before. I'm going through the same process of selecting a go-to blend for it, since I know the general bowl proportions I'm looking for. I'm thinking something with dark fired KY, since I'm currently loving Bourbon Bleu from C&D (though it tends to rub out into thin, square pieces that can easily block the draft). Tastes pretty darn good, and I want that room note right up under my nose. Whiderwarde, I hear ya. I have twovtgat are under 4.5" and it took a few smokes to get used to the shorter pipe, but now I love it. It's funny, sometimes I just know I'm in the mood for a stub and it works. I'm in the process of making a bent nosewarmer. I don't think it's your imagination or user error on the difference between the old and new Original Oriental. It used to be one of my favorites blends back in 2009. The last tin (not bulk, mind you) showed the same characteristics that you mention. This is not the only one of my favorite English/Orientals to experience a seachange. Presbyterian Mixture also comes to mind in this regard. I bought my first Nosewarmer only a couple of months ago. It's a Colja Freehand Poker. Somewhat suprisingly I really like it. I had no trouble adjusting to the shorter pipe. As to the 2045 I can't recall ever smoking any. That's a beauty, AJ! Very Nice!